This is a set of mid century modern set of dining chairs. The set of 4 chairs are from the Young company, have tall sculpted backs with newly upholstered seats in charcoal gray tweed. Dimensions: seat width: 19.5″, seat depth: 17″, seat height: 19″, back height: 39.5″. These are 2 sets of mid century modern dining chair sets. Each set has 2 captain arm chairs and 4 side chairs. 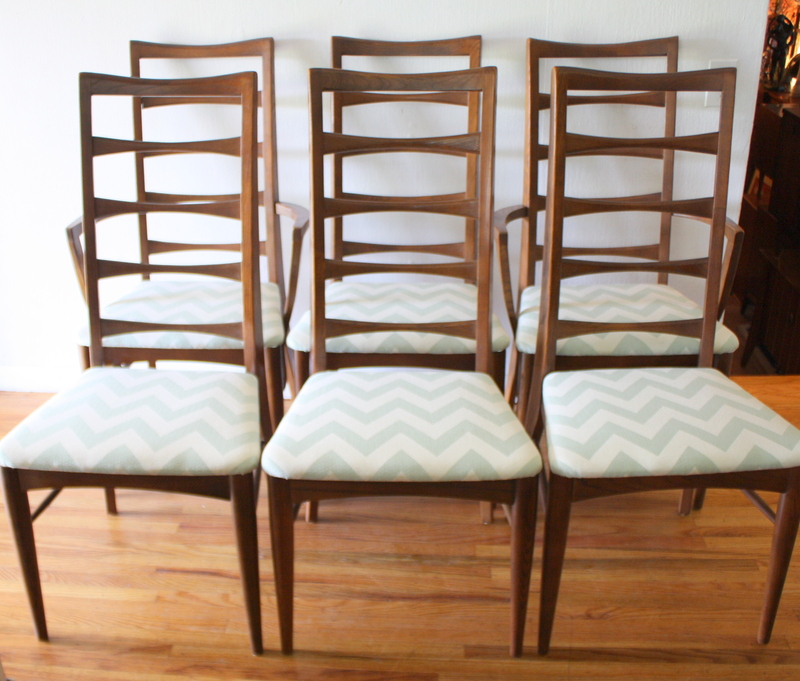 The first set has slatted bowtie design backs, solid wood bases and newly covered seats in an aqua and eggshell chevron. The second set is by Kroehler and has sculpted wood backs, solid wood bases, and newly covered seats in a teal tweed. 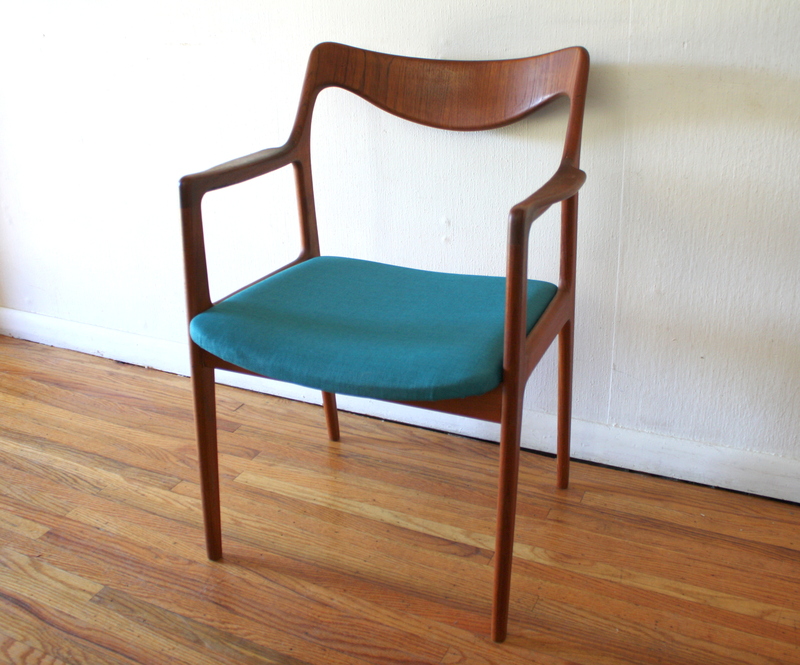 This is a mid century modern teak arm chair upholstered in a sumptuous teal tweed. The chair has beautiful curves and carved arms. It is marked made in Sweden. Dimensions: 18.5″ seat width, 18″ seat depth, 17″ seat height, 30″ back height. 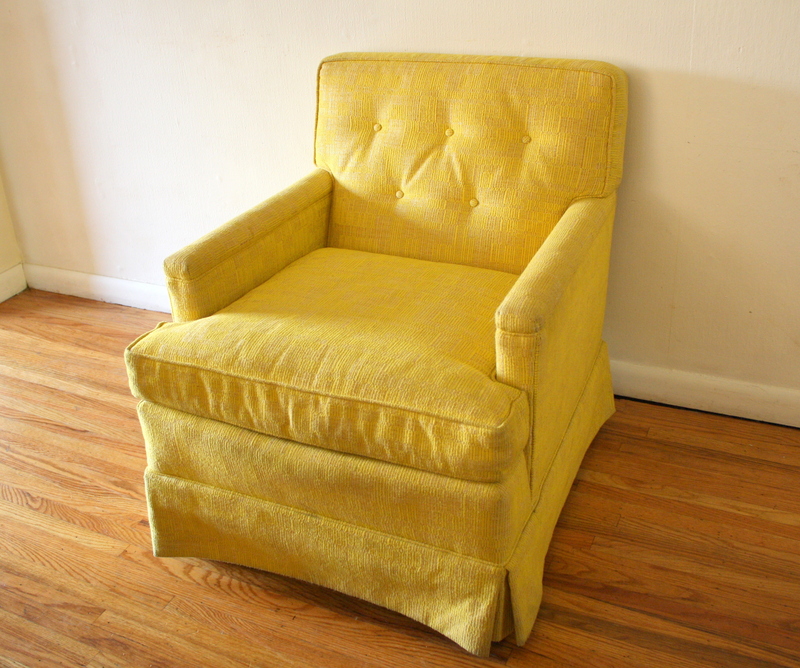 This is a mid century modern tufted skirted arm chair upholstered in a cheerful bright yellow tweed. Dimensions: 19.5″seat width, 18″ seat depth, 17.5″ seat height, 29.5″ back height. This is a mid century modern lounge chair with a detachable desk. The chair is upholstered in orange tweed and has a solid wood frame. Chair dimensions: 22.5″seat width, 19″ seat depth, 13.5″ seat height, 35″ back height. Desk surface dimensions: 19″W x 14.5″D. Chair disassembles easily for shipping. 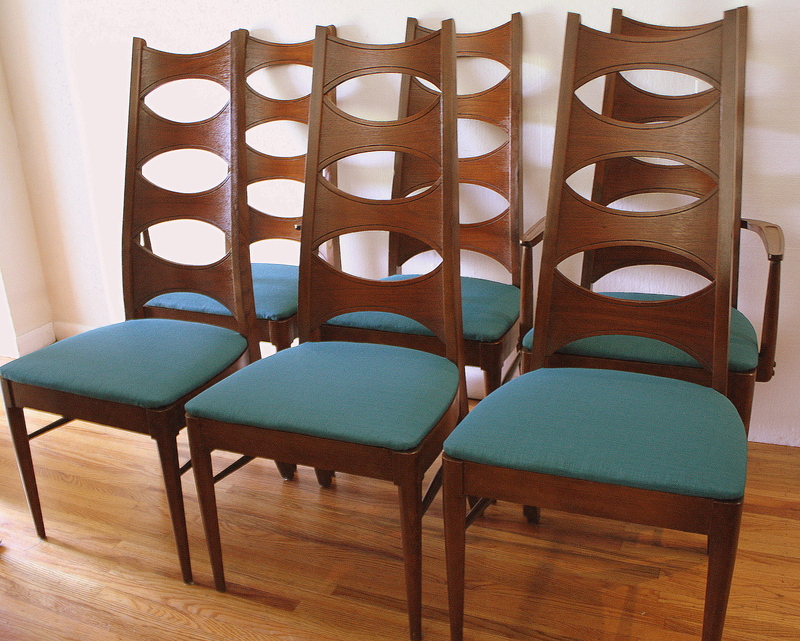 These are 6 mid century modern upholstered arm chairs. 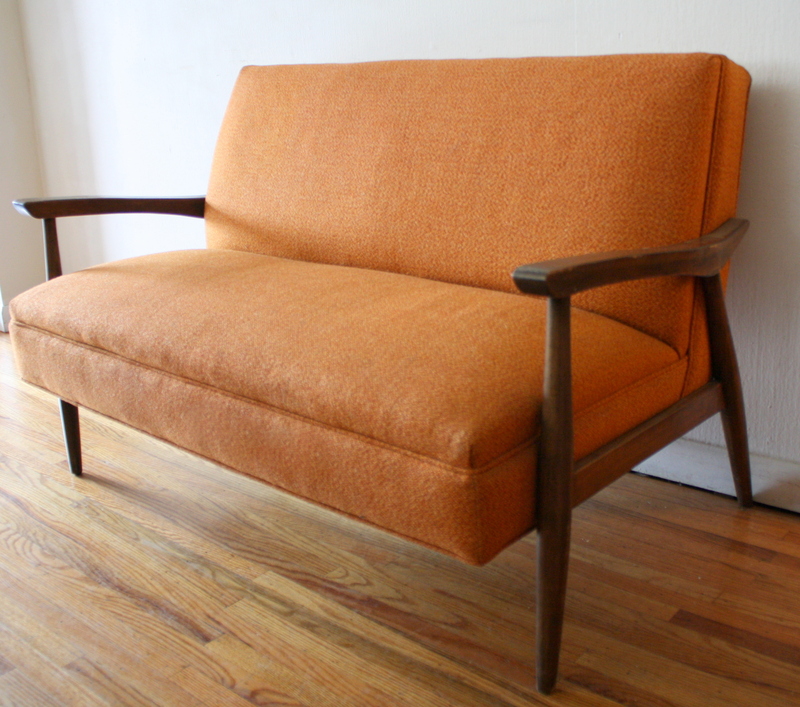 Two are upholstered in orange and black naugahyde. Also featured are an mcm wing arm chair with brass tack detail, and a an mcm arm chair upholstered in green tweed. Lastly there are 2 mcm chrome chairs. The first chair is in the style of Wolfgang Hoffman with curved arm rests. The second chrome chair has a suspended leather seat and back. Comfortable for lounging in beautiful style. This is a pair of mid century modern chairs with solid wood frames upholstered in coffee tweed by Alma. 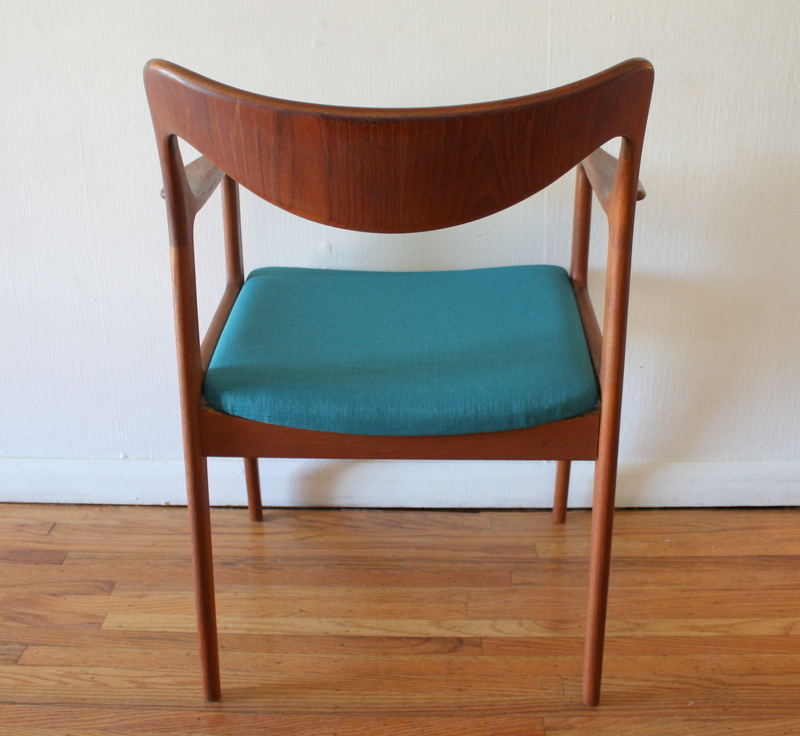 They have beautiful slanted lines in the legs and backs and Danish style armrests.